Cattle Fly Repel is a truly green product. As one of our most successful and biggest selling products. it is specifically designed to repel all bloodsucking, nuisance and disease carrying flies and biting midge. It does an excellent job at repelling ectoparasites and has a good residual effect against lice, ticks and other parasites. Although developed for use in intensive farming, it is also suitable for use in organic farming systems. Ideal for use in the milking parlour, to help calm restless cows bothered by nuisance flies and midges during milking. 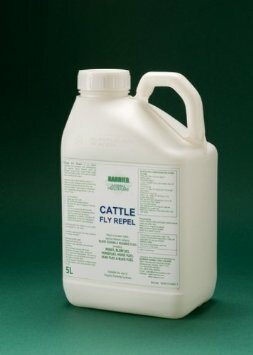 Cattle Fly Repel is made using only pure and natural concentrated plant derivatives. All of our products fall into the exempt category of products which use only plant oils as active ingredients, as listed in Annexe IIB (Pesticides) of Council Regulation (EEC) No 2092/91 (as amended), and so this product is suitable for use in organic farming systems. In accordance with the Biocidal Products Directive, regulations require any product which holds itself out as any form of repellent to secure an approval and licence number from the Health & Safety Executive (HSE). This approval requires the active ingredient (Ai) to be listed on the label together with the amount of Ai being used. Cattle Fly Repel is designed to repel all bloodsucking, nuisance and disease carrying flies such as the sucking fly and all types of Midge. It does an excellent job when applied directly to ectoparasites and has a good residual effect against lice, ticks and other parasites. Cattle Fly Repel has been developed for use in intensive farming but is also suitable for use in organic farming systems. Cattle Fly Repel should be applied every two days until the product builds up in the coat, and then on 5/7 day basis. It is a strong formulation. Apply sparingly and directly onto udders during milking. An ideal product for use in the milking parlour to help calm restless cows bothered by nuisance flies and midges during milking. Care should be taken, as it is a strong formulation. It will build up on the coat, if used every few days, but it is a natural product and so extra care must be taken during wet weather. 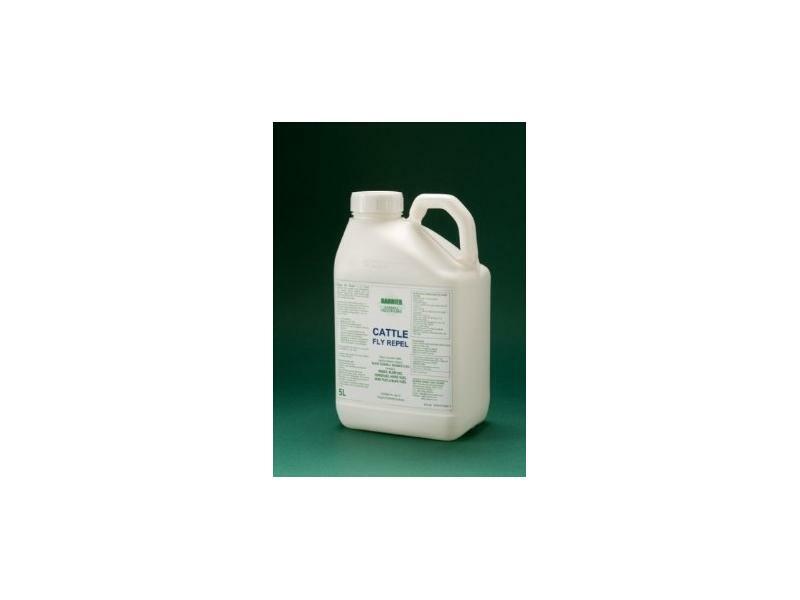 Cattle Fly Repel's formulation is anti-bacterial. It can be applied sparingly to the udder and teats to protect against all known bacteria. No meat withdrawal period is required. Suitable for organic farming systems. Our primary emphasis is on making products that are very efffective, kind to the animal, the user and to the environment. With this in mind we have spent years developing alternative solutions to chemicals. With all the adverse publicity on pesticides that contain organo-phosphates and other harsh and toxic chemicals you can feel safe in knowing that none of our products contain organic acids, natural pyrethrums or permethrins. It is generally known that natural active ingredients deteriorate quickly once exposed to UV rays and air, but Barrier Animal Healthcare have perfected the art of blending many ingredients together to give a much longer life, improved quality and effectiveness to every product. Care must be taken during very wet weather conditions or constant rain. There are currently no questions for Barrier Cattle Fly Repel - be the first to ask one!